1. The Raiders have a solid QB competition. Matt Flynn looked solid with the limited playing time he was given Friday night. Flynn went 4 of 5 for 37 yards including a nice strike to Denarius Moore for 17 yards. Terrelle Pryor played up until the second half looked like a completely different player from last season. Yes he is still a run first QB and is not the best passer in the NFL but you cannot doubt that his passing game has not improved and from what I saw last night, Pryor is working hard to become a leader on this offense and wants to be the man in charge. Pryor ran for 31 yards and threw for 88 and was 6 for 10 with one pick. Now that leaves Matt McGloin from Penn State and Tyler Wilson from Arkansas who split time in the second half. McGloin looked like a young Drew Brees in my opinion and I can see why the Raiders coaching staff choose him over Tyler Wilson. McGloin was 4 of 7 for 78 yards and threw a beautiful rainbow to Brice Butler for a touchdown. It is going to be interesting to see this 4 way competition move forward. 2. The Raiders defense did make some nice plays despite being injured. Right off the bat, it is easy to say rookie Sio Moore is going to be a player. 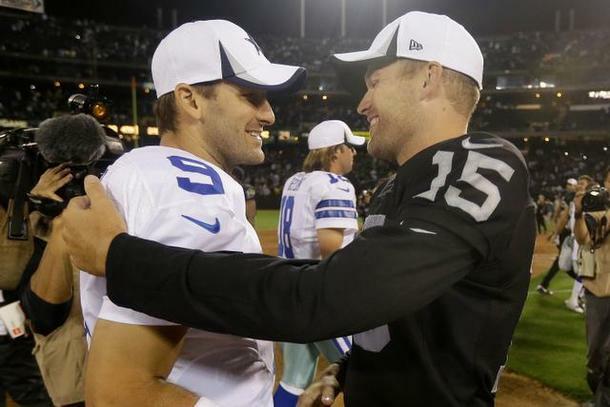 Moore sacked Tony Romo on the Raiders first defensive series of the game. The Raiders linebacking core is looking strong and because the Raiders have no defensive line, the raiders will need to rely on this group to make plays and get pressure on the passer. 3. I am just going to make a quick point, I think the Raiders need to sign a veteran wide receiver. 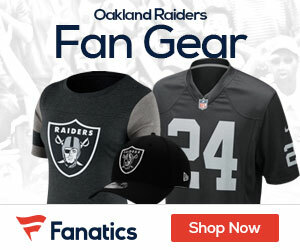 Denarius Moore and Rod Streater are not going to cut it this season. Dennis Allen himself said the Raiders do not have a number one receiver on this team. I do think the Raiders can make some noise but they can’t if they can’t pass the ball. In my opinion, the Raiders missing one solid Receiver and one solid DT from being a contender. Hopefully Reggie McKenzie makes some moves before the season starts for real. So with week 1 of the preseason in the books, what were your thoughts? Were you impressed or not? Who did you think shined? Very impressed. I’ve been a Raiders fan for 40 years and I go back to relying on names like Branch, Biletnikopf, Guy, Schoerder, McCallum, Rice, Brown and Gannon to run the gamut. Oakland actually has a lot of young and impressive new talent this year. I don’t agree with you that the young players need to step up and make something happen, but I do believe Oakland’s young coaching staff needs to instill that in the players on order to “make’ it happen. Oakland has never really been short on talent, but it has been short on solid coaching skills for many years.